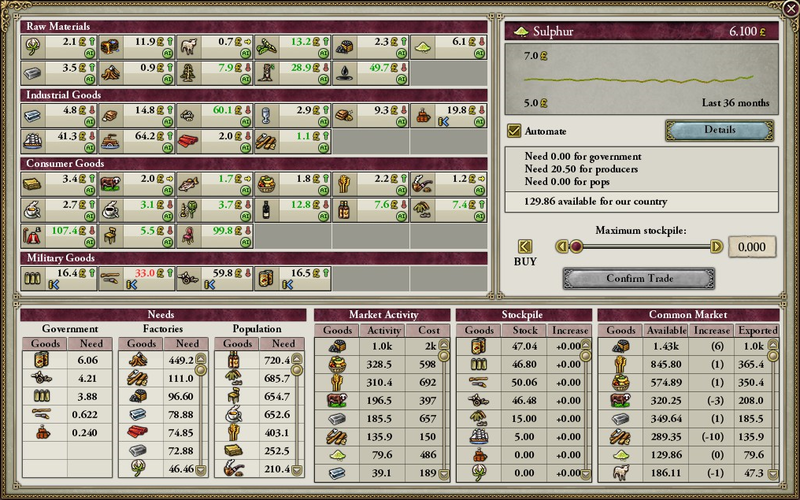 Trade in Victoria II is conducted by the AI and can be defined by the amount of produced goods that are exchanged in local markets and on the World market. Goods produced by RGOs and manufactured by factories and artisans are first consumed by the national market, that is the POPs that can pay for them and by the factories that transform these materials into higher value productions. If the country is a great power, or is a non-great power in a great power's sphere of influence, the leftover quantities of goods that haven't been sold on the national market are then sold to the markets of other countries in the same sphere (sometimes referred to as spherelings). Lastly, any quantities that have not been sold on these common markets are then dumped onto the World market. The World market only buys the amount of goods there is demand for. "If only 90% of the production could be bought then only 90% is bought. The remaining 10% is lost to the system and all the producers only receive 90% of the money they would have got. What this means is that when supply is greater than demand, less efficient producers will be forced out of that market for good [...] the market does not buy goods on its own, it simply acts as a clearing house for goods (as it should do).". Whenever a POP, Factory or Government has a need, it will first try to satisfy that need in the Common Market. If there is no way to meet the Demand on the Common Market, then they will try to buy from the World Market instead. Access to the world market is regulated by each nation's overall rank, therefore the nation with the highest rank buys first, then the second highest and so on. If an item is in high demand, it is possible that nations with lower rankings will not have anything left to buy when their turn comes (this is common early on in the game with clipper convoys, for example, making it hard for an unciv to build or supply a navy). If any country is part of another country’s Sphere of Influence, its national market is joined with its master country and all other members of that Sphere of Influence, making a larger and more versatile Common Market. In this case, tariffs do not apply to trades between nations within the same sphere of influence. Therefore, sphering a nation that provides most of the imports to a Great Power might be counterproductive to the overall economy of the sphere of influence. For example, sphering China could lead to sphere of influence market saturation because of its products entering the sphere of influence market and directly competing with local production. On the other hand, sphering a nation that produces goods in high demand would give direct access to these goods, removing the need to buy them on the world market. For example, Great Britain has most dye RGOs in her sphere of influence and her fabric factories buy dye directly from them, without accessing the world market. Pricing of goods depends on its overall Supply, relative to its Demand. If goods are overproduced, then price decreases with constant speed 0.01 per day until it reaches default_price*0.22 and then price is frozen. If it is RGO only goods, the producers will quickly reduce production until supply matches demand and price is about default_price ± 0.1. If there is lack of goods, then price increases with constant speed of 0.01 per day until it reaches default_price*5 and then price is frozen. 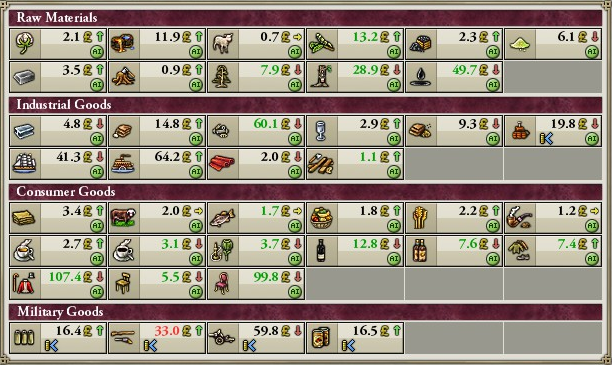 The trade screen can be divided into three sections. In top left you have all the goods that are in the game along with their current price. Top right you have a detailed view of the good that is selected and in the bottom of the screen you have four different tables showing additional information relating to trade. Let's go over these one by one. Raw Materials: Goods that are produced by RGOs. Industrial Goods: Goods that are produced by artisans and factories. Consumer Goods: Goods that are mostly used by pops. This includes both RGO produced goods like cattle and fish, as well as artisan/factory produced goods like liquor and clothes. Military Goods: Goods that are mostly used by governments for military units and forts. Note that not all goods are present here at the start of the game. Goods like radio or aeroplanes only become visible here once you research the appropriate techs. The current price of the good. A little arrow next to the price(this indicates how the price has changed since yesterday). A green circle with the word AI written in it(this indicates that the trading of this good is currently automated). A stack of coins with a blue "lesser than" sign next to it(this indicates that the good is currently being bought into your stockpile). You can also see in the screenshot that some of the prices are in different colors(black, red or green). This indicates how close the price is to the base price. If the price is more than 10% above the base price, it will be green. If it's more than 10% bellow base price, it's red. If it's within +-10% of the base price, it's black. If you hover over the good icon you can see the top 5 producers in the world and how much they produce. If you hover over the price you can see the global supply, demand and "actual bought" of that good. Note that the "actual bought" can be different than demand since not everybody who wants that good can necessarily afford it. If you hover over the arrow you can see how much the price has changed since yesterday. If you click a trade good it will be selected and will show additional info on the right side of the trade screen. If on the other hand you click the good icon, it will open the production window for that good. The exact price of the good and how it has evolved in the last 36 months. The automate checkbox. While this is checked the computer will handle the buying and selling of this good. Unchecking it means that it is up to you to decide how much to buy this good. All goods are set to automate at game start. Details button. This will open a new window that shows more info about this good. Domestic demand. This is divided into three sections: "need for government", "need for producers" and "need for pops". Note that demand will often be higher than what is actually bought since pops and factories might not be able to afford it. Also the "need for producers" does not include artisans demands. "Available for our country". This shows the quantity of this good that you have direct access to. So in other words, it's your countries production + your spherelings production + your stockpile. This means factories/pops can usually buy more than is "available for our country" since this stat does not include goods that are in the Global Market. Buy/Sell slider. 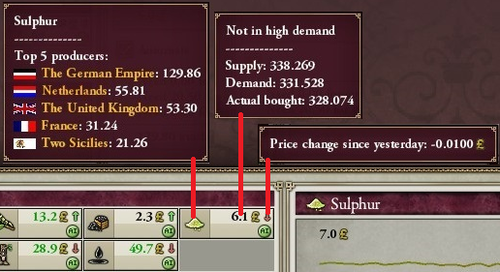 If you uncheck the automate checkbox, you can then use this slider to decide how much of this good you want to have in your stockpile. Click the button next to the slider to show either buy or sell, then set the amount on the slider and hit Confirm Trade. The AI will now start buying/selling that good until your stockpile reaches the desired quantity - and then stay there. Here we see four sections: Needs, Market Activity, Stockpile and Common Market. Government: Goods needed for military units and buildings. Factories: Goods needed for you factories to work properly. Population: Your populations life needs, everyday needs and luxury needs. Market Activity shows how much of that good your common market(you + your spherelings) exported(if the numbers are positive) or imported(if they are negative). Stockpile shows how much of each good you have in your stockpile. "Increase" shows how much this has changed since yesterday. Common Market shows how much of each good was "available" in your common market. "Increase" shows how much this has changed since yesterday. "Exported" is somewhat misleading as it's not how much was actually sold but rather means how much was available for export. So if you look at the screenshot on the right, we can see that 320.25 cattle was "exported"(available for export), but under "market activity" we can see that only 196.5 were actually sold. 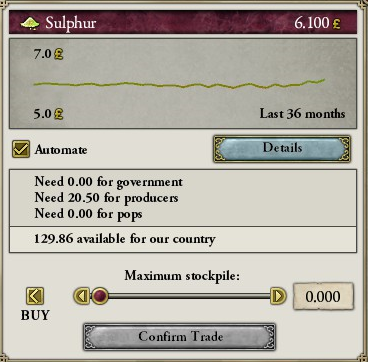 ↑ Paradox forum Developer Diary 17 : The World Market and Buying, posted on 24 March 2010. This page was last edited on 8 May 2018, at 10:23.